Not only does this appear for merged organic listings, but organic listings that have yet to merge with its corresponding Place page listing. For an example of this, key in ‘sydney accommodation’. 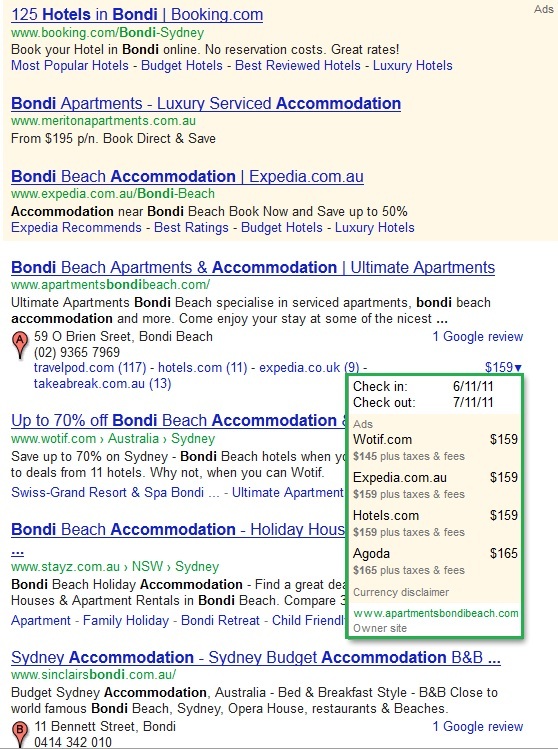 The results of the search query show that Google is pulling the pricing for the various ads in the Place results from accommodation directory websites such as Wotif.com or Expedia.com.au. 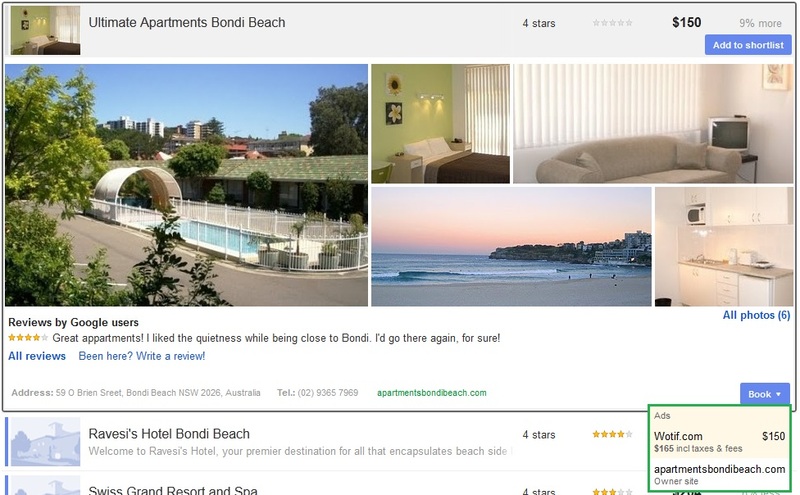 If you’re a regular reader of our blog, you’ll know that Google recently put together a little feature called Google Hotel Finder, a go-to place to find out pricing for accommodation. It’s obvious the pricing is being aggregated through Google Hotel Finder, which would in turn source data from these various websites. Being that the Places ads are still in beta testing, we weren’t surprised to notice discrepancies in pricing when selecting dates 6/11/11 to 7/11/11 through a Places ad and again through Hotel Finder, though when clicking through they both went to the same pricing page. This is yet to be rolled out across all Google Places listings for the accommodation industry, since it does seem you need to sign up to Google Hotel Finder for everything to sync up. It does lead us to speculate that Google are able to pull this off, they can then take this particular approach with every industry where pricing is readily shown online. Similar to how Google Shopping is creeping its way slowly into organic listings, or to Google Flight search. In this case, the key difference is that Google is basing their new revenue stream entirely on location.